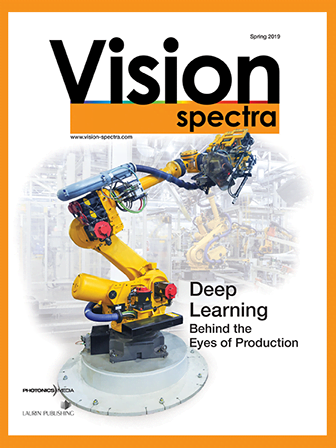 Welcome to the Vision Spectra news page where you'll find the latest vision business and technology news covering cameras, imaging, AI, automation, optics, sensors, software, boards, embedded vision, and more. Check the topic navigation at the top of this page for curated content on industry segments that interest you. Visit www.Photonics.com/prsubmit to submit vision-related news about your company. Active Silicon Expands in the UK LANGLEY, England, April 11, 2019 — Active Silicon has opened a new, state-of-the-art production and operations facility in Langley, England, where the company has relocated its assembly, testing, inspection, and supply chain functions. Leoni to Present Turnkey Machine Vision Systems, Solutions at Automate Lake Orion, Mich., April 4, 2019 — An interactive vision-guided assembly system and some of the latest solutions for factory automation will be exhibited by Leoni Engineering Products & Services Inc. (Leoni EPS) at the Automate Show in Chicago, Ill., in Booth 7507. Photoneo Opening New U.S. Branch for Its 3D Vision Technology BRATISLAVA, Slovakia, March 27, 2019 — Photoneo, a developer and provider of 3D vision systems for advancing automation, is opening a new location in Boston (Cambridge), Mass. The move is part of the company’s overall growth strategy and will provide local support to U.S. clients.